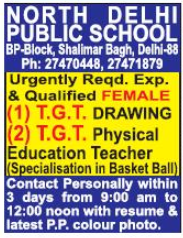 North Delhi Public School, New Delhi has advertised in THE HINDUSTAN TIMES newspaper for the recruitment of TGT jobs vacancies. Interested and eligible job aspirants are requested to apply with in 3 days. Check out further more details below. About School: North Delhi Public School, Shalimar Bagh was the brain child of the Chairman Mr. J.K. Kesar. It was established in the year 1985 with an aim to provide Excellence in Education and ‘All round Development’. North Delhi Public School received recognition in the year 1988. It was 2001 when the school was upgraded to senior secondary and also got affiliated by CBSE.